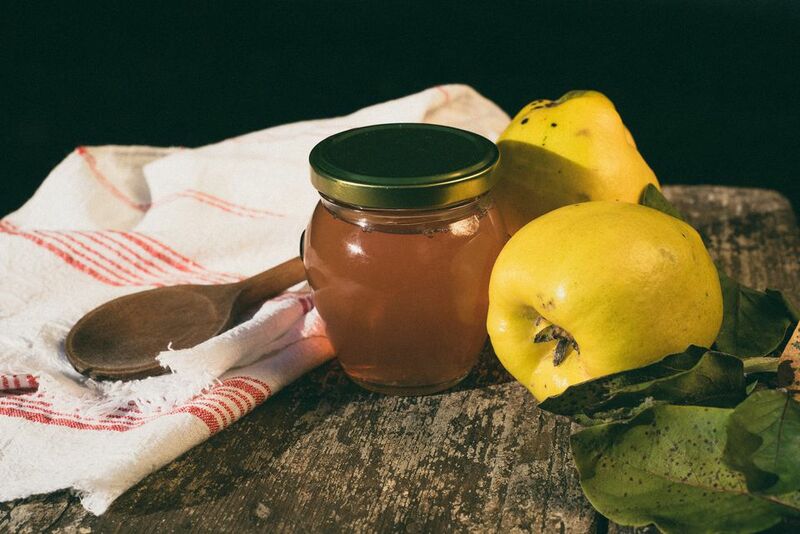 Quinces are high in pectin making them a natural for jams, jellies, preserves and butters. This unusual fruit is a cross between an apple and a pear in appearance but the taste is very astringent and needs to be cooked to bring out its flavor, when its pale yellow color will turn orangey-red. The initial cooking can be done in a pressure cooker, if desired. If sieving is a chore, peel the fruit before cooking. View this larger image of quince butter. In a medium saucepan, combine quinces, water and lemon juice. Bring to a boil, reduce heat to very low and simmer until quinces look like applesauce, stirring occasionally. Pass the puree through a sieve or food mill. For every cup of strained puree add 1 cup sugar and choose one of the following cooking methods. Place sweetened pulp in a slow cooker with lid partially off to let steam escape. Set at low and cook, stirring occasionally, for 6-12 hours or overnight, or until thick enough so the butter doesn't run off a spoon when turned upside down. Place sweetened pulp in a microwave-safe bowl and cook for 20 minutes at a time, stirring frequently until thick enough so the butter doesn't run off a spoon when turned upside down. Place sweetened pulp in a medium saucepan and cook over low heat, stirring frequently, for 1-2 hours or until thick enough so the butter doesn't run off a spoon when turned upside down. Place sweetened pulp in a heatproof casserole dish or roaster. Bake, stirring only occasionally, for 1-3 hours or until thick enough so the butter doesn't run off a spoon when turned upside down. Place hot butter in hot sterilized jars, leaving 1/4" headspace. Cover with hot sterilized lids and rings. Process in a water bath for 10 minutes. Remove to counter and allow to cool before storing in a cool, dry, dark place. If you don't process in a water bath, the butter can be kept refrigerated for up to three weeks or frozen for up to one year.